We have a beautiful outdoor light pink and blue wedding reception for today’s inspiration! We just love that robin’s egg blue color on all of the linens. The soft pink roses, peonies and dahlias of the centerpieces are so soft and romantic and seriously lovely. Did you spot the covered book table number? We just love the calligraphy on it. It just ads to the quaintness of this look! We also love out beautiful this the scenery is in the outdoor wedding. What a lovely space to have a wedding! It is genius that they put the knives over the menus on the place settings to a nice detail and to hold them down in the wind. 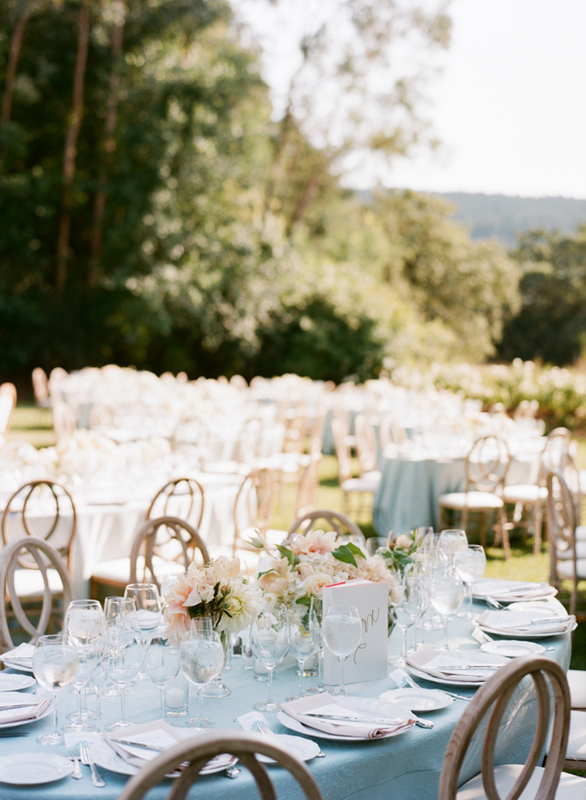 The light brown chairs with their soft circle backs are just amazing for this reception look. They are seriously lovely and really bring this look together. We are completely smitten over this light pink and blue wedding!